CDIA, through its Project Coordinator for China, Ms. Chenzi Yiyang, participated in the 2018 China-ASEAN Environmental Cooperation Forum on 11-12 September 2018. The event was aimed at improving environmental governance, by 1) strengthening cooperation between the Association of Southeast Asian Nations (ASEAN) and China; 2) sharing knowledge and experience on the strategies, policies, action plans and initiatives on environmental information and data management; and 3) expanding international cooperation and partnership. 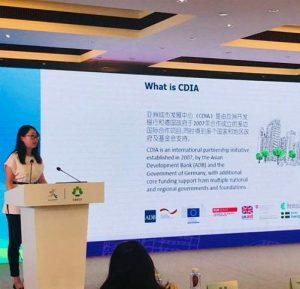 At the Sub-Forum 1: Eco-city Construction for Achieving the 2030 Agenda and SDGs, Ms. Yiyang shared CDIA’s experience in supporting cities in achieving the Sustainable Development Goals (SDG) by improving the bankability of infrastructure projects in China. The session served as a venue for exploring innovative actions toward ecologically sustainable and socially inclusive urban and peri-urban planning and management, while discussing possible ways to engage with multiple stakeholders from the government, private sector, and diverse communities in an effort to achieve SDG 11: Sustainable Cities and Communities. City representatives from China, Thailand, Vietnam, Cambodia, the United Nations Environment Programme, as well as some private sector representatives shared their experiences and innovative actions to achieve urban sustainability. The session was organized by China-ASEAN Environment Cooperation Center and Stockholm Environment Institute.